In 2009 two friends/colleagues – Andrea Piovani and Paolo Sinelli – attended Over the Air in Bletchley Park, UK. They liked it so much that they decided to set up the same event in Italy. 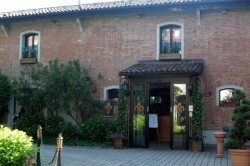 With their colleague, Riccardo Bosio, they set up the first barcamp in Cremona. Doing some research by digging into Twitter, they found out that a third Italian went to Over the Air – Alfredo Morresi. They duly invited Alfredo to the barcamp. The next year they all went to “The Mobile World Congress” in Barcelona. Over dinner, the seeds were planted/sown for the first WhyMCA or Why Mobile Community Applications – that was February 2010. In May, the first WhyMCA took place – only a few months after the decision was taken. Scary, but I suppose that shows what one can do when the belief is there. 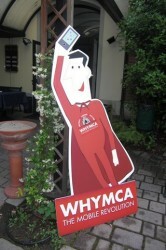 Approx 250 people attended the first one-day event in Milan – Success WhyMCA was no longer a dream! 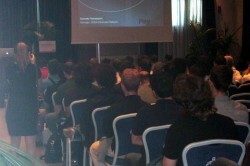 In 2011, there was already a big change: from a one-day event we are now on two days – again the venue was Milan and about 350-400 people attended. In 2012 there was yet another big change – it moved from Milan (northern Italy) to Bologna (central Italy). I should think this was a very difficult decision to make but what else can you do when you live in a very narrow but long country. Somehow you need to be in the centre to appeal to most of the community. These events keep the community focused and up-to-date. There might have been a couple of non-Italian speakers including Drew Robbins from Microsoft who gave a talk on “Windows 8 Platform for Metro-style apps”. One very popular talk was by Andrea Picchi from the Department of Computer Science at Pisa University “Le Variabili Cognitive del Processo di Esperienza Utente” that becomes “The Cognitive Process Variables User Experience” according to Google Translate. People were queuing outside of the door to listen to Andrea. With some great sponsors – Nokia, Microsoft, Blackberry, PayPal etc. the conference is free as well as free coffee and free mojito. What else can I say about this conference? Not one visible hiccup on the organization side, a fantastic venue – ideal holiday place and Bologna has the reputation of producing the best food in Italy. What more can one ask? Yes I know – when and where is the 2013 conference going to be… I suppose I will be told 3 months in advance.